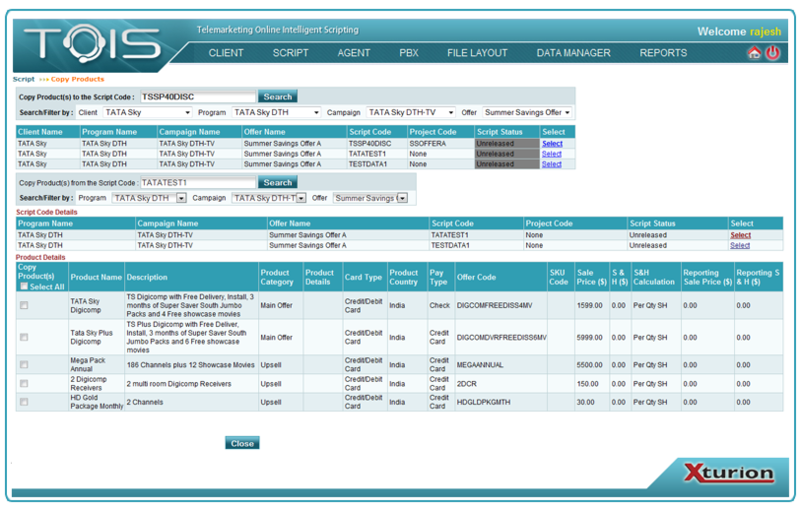 The Script module of TOIS enables users to set up, create, copy, edit, preview and release telemarketing scripts to live production. It includes functions for total scripting control such as Script Set Up, Media Set Up, Call Dispositions, Manage Script, Copy Scripts, View Products, Release Scripts, and Reactivate Scripts. 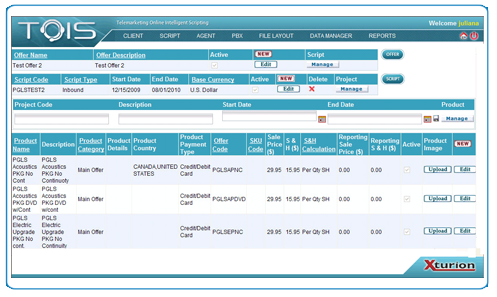 The Script Set Up function in TOIS enables users to set up each telemarketing script. The set up includes naming and creating details for the program, campaign, offer, script code, project code, products to be offered, offer codes, sku codes, pricing, etc. The Media Set Up function allows users to input the media details that will be linked to the telemarketing script for proper profiling and reporting. The media details are typically set up for media such as television, print, or for web sites. In order to create and manage telemarketing scripts users will access and use the Manage Script section. 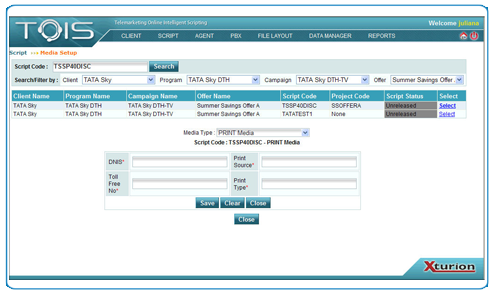 In the Manage Script section, the user can create, edit, copy and preview telemarketing scripts. 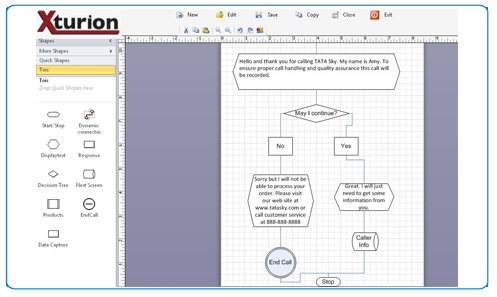 The TOIS scripting engine uses MS Visio which enables users to drag and drop scripting objects, add copy to scripting objects, use connectors to linked objects for the call flow and map products to objects for unlimited up sells, cross sells, and down sells. There is also a call disposition section where each script can also be assigned unique call dispositions for agents to log each type of call. The copying of scripts and products is a feature located in the Copy Scripts functions. Once telemarketing scripts and products are created they can be copied and edited to create new scripts to test or roll out. 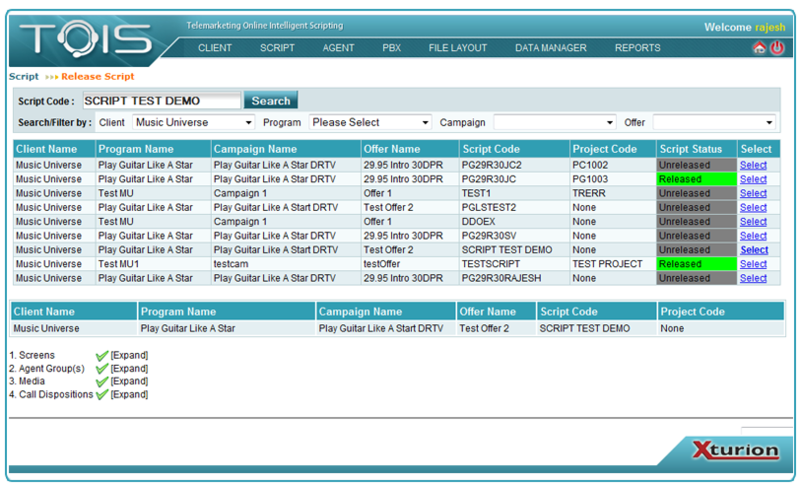 Telemarketing scripts are made live by activating the release function. The release function checks to ensure all required set up is completed before going live.